The AT5040 is a polished performer in so many ways but that price tag - ouch! Stylish, functional and incredibly well made. Natural open sound. Big output level and very low noise. With a new large diaphragm condenser mic there's rarely anything unusual to discuss. After all, the focus is typically on the general frequency response, pick up pattern, build quality and sound. 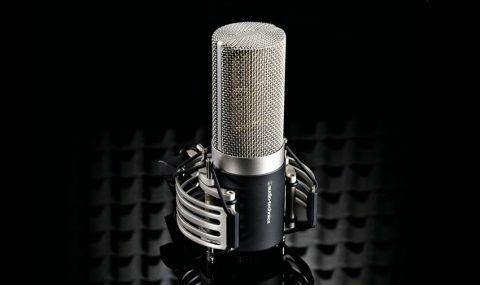 Audio Technica's new AT5040 ticks all the boxes of a typical high end phantom powered condenser mic with its discrete component design, low noise, high SPL handling and decent shock mount. "The noise figure is exceptional and the quick release cradle beautifully designed"
Look closer, however, and you will find some special touches. The noise figure is exceptional and the quick release cradle beautifully designed (more later). Also worth mentioning is the advanced internal capsule decoupling mechanism and the fact that it's 100 per cent hand built and inspected. The really big deal here - bigger than that whopping price tag - is the capsule: a four-part rectangular design delivering over ten square cms of surface area (roughly twice that of a one inch capsule). Put into perspective, a circular design with roughly the same area would have a diameter of 3.6cm. Why is that such a big deal? Well, the idea was to gain the benefits of a larger diaphragm (namely higher sensitivity and lower noise) without succumbing to the limitations of a single large diaphragm (namely limited high frequency response). As such, Audio has opted to use four matched rectangular elements, summing the outputs together. The technique essentially uses one pair for the hot side of the signal and one pair for the cold, resulting low self noise (5dB A-weighted) and great sensitivity (56.2 mV/Pa). This company is renowned for using pre-charged electret capsules and the AT5040 is the same. So rather than tapping into the phantom power for the DC bias, it makes use of it to improve peak SPL handling (142dB SPL). When it comes to that cradle, yes. The C-shape design makes it visually similar to some of the Brauner cradles, and coupled with the magnetic clips and locking makes it both quick and reliable. As for isolation, it's effective in listening tests but if you stamp the ground with the mic mounted a noticeable subsonic frequency shows up on the scope (around 20Hz). "This works great on vocals and, when positioned carefully, on acoustic guitar, percussion and drums"
As mentioned in its literature, the AT5040 does have reasonably smooth off axis response for higher frequencies (5kHz to 20kHz). Even so, the cardioid polar pattern is tight for this frequency range and when moving off axis horizontally we noticed a tail off from 30 degrees, and certainly by 45 degrees you're losing high frequency content. Watch this in the vertical plane too, although the difference is less marked than with other rectangular capsule mics like Sweden's Pearl ELM-C. This is something to be aware of when working with animated vocalists. So, how does it sound? Pretty neutral. There's no real evidence of a big high frequency lift and the subtle peaks and troughs in the frequency response aren't obvious. That said, there's a wonderful openness to the sound. This works great on vocals and, when positioned carefully, on acoustic guitar, percussion and drums. The sound also responds well to EQ. The high output is very noticeable and we found ourselves trimming the mic pre down considerably from our typical settings. All in, this is a lovely, well made mic even if does cost a lot.